Why can’t I make myself DO stuff? This is a constant theme with people that would rather be out with their family, friends, and colleagues than doing stuff that makes us all seem like we are disciplined and responsible people. So how do we force ourselves to finish those pesky tasks we managed to at least start, or get started on the ones we’ve been procrastinating forever? Grab a partner! And be a partner to your children. Most things are easier to tackle with another person helping you, and you’ll find yourself having more fun with it that way too. The summer season is the perfect time to get outside and help a neighbor…and who knows, maybe when you’re done being a partner to them, they’ll be a partner to you and help you get something done as well. I call that a win/win. Avoid the TV. Move it away from places that you will be sitting, or sit where the TV isn’t. If you sit down to catch the news after work, the law of inertia will most likely keep you there. Especially if you combine it with the mind-numbing properties of TV. Go straight from changing clothes after work to tackling one small project that needs to be done. That feeling of accomplishment, no matter how small of a task it was, will most likely give you the momentum you need to tackle the next thing on your list too. Purchase a Robot vacuum cleaner. You would be surprised at what a difference it makes to have that little bit of help. It’s really no different than a purchasing a cleaning solution to break down the grease, it’s just slightly more expensive. I happen to believe you’re worth it. If you don’t already do this, go straight to YouTube for the most efficient way to complete any project. The amount of free information there is quite incredible! Break a larger task into parts, and take on one part per day. 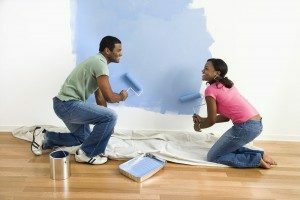 For example, you want to paint the room. Move the furniture and set out the painting equipment (day 1), paint half of the room (day 2), paint the other half (day 3), clean up (day 4). It would take 4 days, but it is finished and you didn’t get overwhelmed and quit or procrastinate it any longer. Debate with yourself efficiency vs. effective (Which is more important?). Not everything has to be done perfectly…sometimes “good enough” really is good enough. Decide in advance when you will finish a project…giving yourself a deadline can put a little fire in your belly. Everyone is different and we all have to find our way with completing the boring tasks in life. Get to know yourself if you don’t already. For some, it’s easier to focus on one thing at a time. If that’s the case, it may work for you to make lists of your tasks in order of priority and methodically move through them. For others, it may be easier to work on 3 projects at a time and switch off between them until you’ve completed them all. That break you get between working on one project and moving to another creates some distance from each project and allows you to go back to it with renewed interest and a desire to finish. If you need help figuring out which type of person you are, or would like to go into further detail and learn more strategies for tackling the “musts” in life, call me for a free consultation.